Our product line has been an ongoing evolution over the years, the result of constantly searching for the highest quality components at the best price for our customers. Below you will find clickable links for all of our current offerings, separated by type. By clicking on the logo of any given vendor you will be taken to that particular web site where you can get additional information on the products. After reviewing the various product lines please come into our showrooms where we will happily demonstrate and explain why they are our components of choice. At Stereotypes we know our customers and their taste. We welcome them to upgrade and expand their systems on a regular basis. We gladly take in trade equipment that is in perfect condition and working order, then test it ourselves. It is a great way for others to add to their systems. You can also get fantastic deals on our demo equipment, which is continuously being changed. 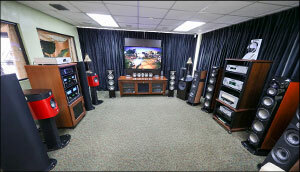 Stereotypes was founded in 1982, as a family owned and operated business specializing ONLY in high-end home audio/video equipment, accessories and related services. We maintain a staff of trained professionals to guide you in creating a system that fits your needs. Let our knowledgeable and professional sales staff help you in adding to or upgrading a system you may already have. Stereotypes has equipment to meet the needs of everyone, no matter what your budget may be. There is no job that is too small or large. Let our knowlegable and professional sales staff help you in adding to or upgrading your existing system.